I love speaking in front of large groups. I love speaking when it’s being recorded and will go up permanently on YouTube for all the world to see. I especially love doing all the above when I’ve only had two hours of sleep because I was up until 3 am finishing my slides for my talk and then getting in some last minute practice, even though this is exactly what I swore two months before that I absolutely would not do. I grew up in the United States and as a youngster said the Pledge of Allegiance every day in my school classes with my hand over my heart. Why did I say the Pledge? Because that’s what everyone around me was doing. What did the words mean to me? Nothing–I never thought about them. You may start out reciting positive affirmations and see changes in your behavior and your life at first, but then as the affirmations become rote you ignore them and they lose their effect. The words are coming out of your mouth but that doesn’t automatically mean they’re engrained in your heart and mind. What to do instead: Set a reminder in your calendar, no more than monthly and no less than annually, to review your affirmations and for each one ask the question “How has this affirmation changed my behavior in a tangible way since the review?” If you can’t think of a real result you’ve achieved from the affirmation make a goal related to it along with action steps to achieve that goal. This will give your affirmation the weight of action and you’ll find it more meaningful when you repeat it. The problem with affirming something about yourself is that you’re committing yourself to action, and you may not really want to do what you’re committing to do, and so you may feel that affirmation is insincere. For example, let’s say that my affirmation is “I eat healthful foods.” But what if I don’t really want to eat healthful foods? What if what I really want to do is eat Swedish Fish morning, noon, and night? What if what I really want to be able to say is “I eat candy all day and yet I’m ripped like Bruce Lee”? What to do instead: The interesting thing about sincerity is that you can trick yourself into it by wanting to want what you should want. If I feel insincere saying “I eat healthful foods” or even “I want to eat healthful foods” I can say “I want to want to eat healthful foods.” I’ve used this trick time and time again and it works for me, that is, it changes how I feel and leads to positive changes in behavior that produce the outcomes I want. When my problem is a pain in my knee, saying, “Even though my knee hurts, I deeply and completely accept myself,” sounds true. I do accept myself even though my knee hurts. There is no resistance to getting over this knee pain problem. But if I hurt my knee by kicking the dog for which I feel deep regret and shame, I would not accept myself, would I? Then that set-up statement doesn’t sound true. I don’t accept myself even though my knee hurts because I know I hurt my knee in a deplorable manner for which I condemn myself. And that’s when the customary affirmation isn’t affirming. I cannot say, in this instance, that I accept myself. It just isn’t true. If I say it mechanically […] I will wince inside. I will feel a resistance toward the affirmation. I’m ashamed of my bad behavior. I will not do it again, or at the very least I will keep working at not doing this until I succeed or die trying. If necessary, I will find help to stop doing this. The more committed we are to correcting the negative behavior, the more able we are to truly accept ourselves despite our faults. I hesitated to bring this one up because at least half of us are trying to do too little rather than too much. The other half are women. Call me sexist or a slave to stereotypes if you will, but my life experience is that many women try to do everything and are racked with guilt when they can’t do it all perfectly. I’m sure some men are this way, but my experience is that men are all too good at saying “Oh well, so it didn’t work, at least I tried.” For over-achievers merely entertaining the idea that they may be trying to do too much causes a mental breakdown of sorts and thoughts like “But I could be doing more!” or “I could be doing this better!” and “If I’m willing to not demand total perfection in myself, I might as well just give up on everything and lounge around in sweatpants eating ice cream and watching Seinfeld Season 5!” For these folks it’s all or nothing–there is no room to be at 99% and still accept oneself. People who are walking around as perfectionists are ultimately afraid that the world is going to see them for who they really are. Are my thoughts factual, or are they my interpretations? What’s the worst thing that could happen? How likely is that to happen? Will this matter in five years? At the pivotal moments of my life (read: moving abroad or childbirth), will this moment actually matter? He who has a good enough “why” can figure out the “how”. Why do you need to overcome perfectionism? Because it’s negative behavior. First, it represents a false reality, either that we can become perfect, or that we’re hopelessly miserable creatures–neither is true. Second, it leads to inaction and limited potential. Here’s an example from my own life. But I wasn’t following my own advice. I knew I should be doing video, but I was afraid to do it. I like writing. Writing is easy. This very blog post you’re reading? I accidentally hit the publish button before I was done writing the words you’re reading right now. No problem, I just finished writing it. With video, you can’t go in and edit the details so easily. With writing, I can make myself look good. With video, people see the real me. They see my face, my imperfect skin, my unshaven beard, my poorly combed hair, they hear me make mistakes and doing retakes is a pain plus then I feel scripted, etc. Ugh. It’s embarrassing. Writing? Easy. Video? Hard. Enough was enough, I finally swallowed my pride and embraced the awkwardness and started filming videos of myself, talking about how to become an influencer. Here’s my first video on the Influencer Inc YouTube channel. Professional? No. But within the first week hundreds of people had seen it, and my marketing agency got a lead because of it. Dang it. Where would I be today if I had started doing this three years ago? But my perfectionism held me back. The way we say it matters. A lot of affirmations begin with “I am…” or “I will…” and for some people that feels like a lie, or that they’re saying too much, or it just feels weird and awkward. So they give up. What to do instead: There may be more to this than just mere awkwardness, and a scientific reason to change the words you use. 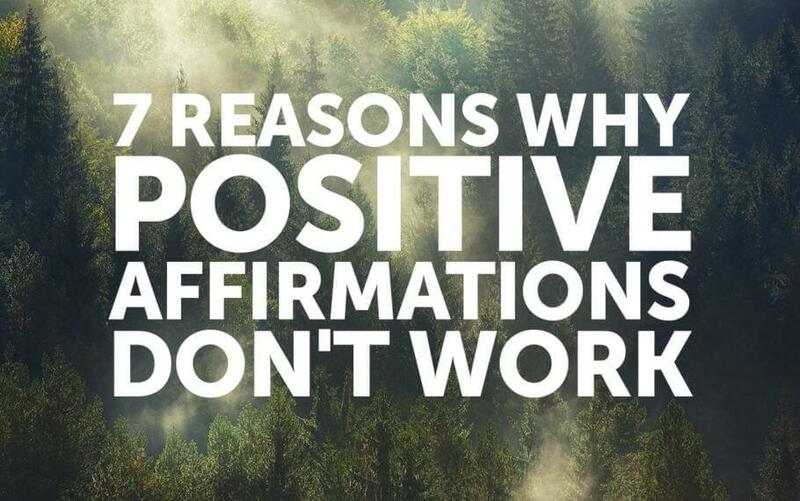 In her post Why Positive Affirmations Don’t Work, psychologist Dr. Sophie Henshaw references a study by Drs. Senay, Albarracín, and Noguchi, published in the journal Psychological Science, and called…wait for it, Motivating Goal-Directed Behavior Through Introspective Self-Talk: The Role of the Interrogative Form of Simple Future Tense. Sophie goes on to say that that questions can lead to action in ways statements may not. If you’re finding that making statements isn’t working because you don’t believe them, or they’re too easy to ignore, try turning your statements into questions and see if that does a better job for you. Read quickly through 50 affirmations. Total time invested = 5 minutes. Spend the rest of the 16 hours of your waking day telling yourself 5,000 times, in one way or another, what a loser you are, how you’re surrounded by losers, and how miserable your life is. 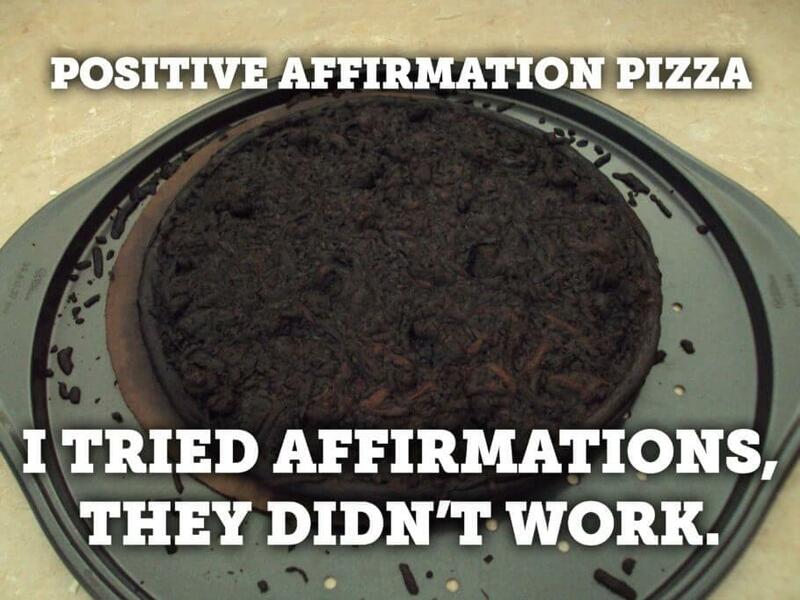 Yeah, that’s called the positive affirmation pizza. What to do instead: Don’t blame affirmations for not working if you’re not really giving them a chance. Give it a real try. But what does it mean to give affirmations a real try? Saying 100 affirmations instead of 50? Squeezing your eyes shut while you say them and really trying to mean them when you say them? Well, actually yes, quantity is part of it. If you’re saying your affirmations 100 times instead of 50 that’s not enough, but if you create a mental trigger so that each time you have a negative thought you catch yourself and say “Wait, no, I refuse to get down on myself, I’m going to say the positive version instead,” then you can replace the negative affirmations with positive ones and leave no room or time to dwell on the negative stuff. But what if I really am a bad person and all the negative stuff I tell myself about myself is true? If you’ve tried positive affirmations and they didn’t work, give neutral affirmations a try first, and let me know if that pizza tastes better. Someone made me watch a DVD of The Secret several years ago and while I found it mostly harmless I had two problems with it; 1) I don’t trust men in light-colored suits, and 2) the DVD peddled this idea that if you simply think about what you want, some mystical “law of attraction” will magically bring it to you. There was no mention of actually DOING ANYTHING. You know, like if I want a diamond necklace, maybe instead of just thinking about it perhaps I need to find a way to make the money to buy it? Maybe I missed part of the DVD, or maybe that “doing something” part was in the book and somehow got left out of the DVD, but it seemed to me a key point to leave out. Yes, part of the point of positive affirmations is that they’re supposed to make it easier for you to change your behaviors, almost as though you weren’t trying at all, but maybe you’re really, really good at making sure that no matter how many positive affirmations you say, you never actually change your behavior. What to do instead: As the Bible says, “Faith without works is dead.” Or as my dad told me when I was young, if you fail to plan you plan to fail. The point of affirmations isn’t to try and let them do all the work for you, it’s to allow them to give you a boost so that it’s easier to change your behavior and harvest the positive results. Affirmations should be accompanies by goals, plans, programs, schedules, and other tools that will help make those affirmations reality, or help those affirmations to produce positive results. I don’t know. That is, there is probably a reason why positive affirmations don’t work that I haven’t listed here. Are you an influencer who has used positive affirmations and gotten positive results? Have you tried and failed for a reason not listed above? Tell me all about it in the comments below.